Battery A: At Albuquerque, New Mexico with two 12-pdr field howitzers and two 3-inch Ordnance Rifles. Same as the previous quarter. Lieutenant John B. Shinn was in command of this battery. Shinn’s promotion to captain would come in January of the next year. Battery B: Given the annotation “Infy. Stores” at Camp Reynolds, on Angel Island, off San Francisco, California. Lieutenant Louis Hasbrouk Fine was the senior officer with the battery at this time, but Captain (brevet Major) George E.P. 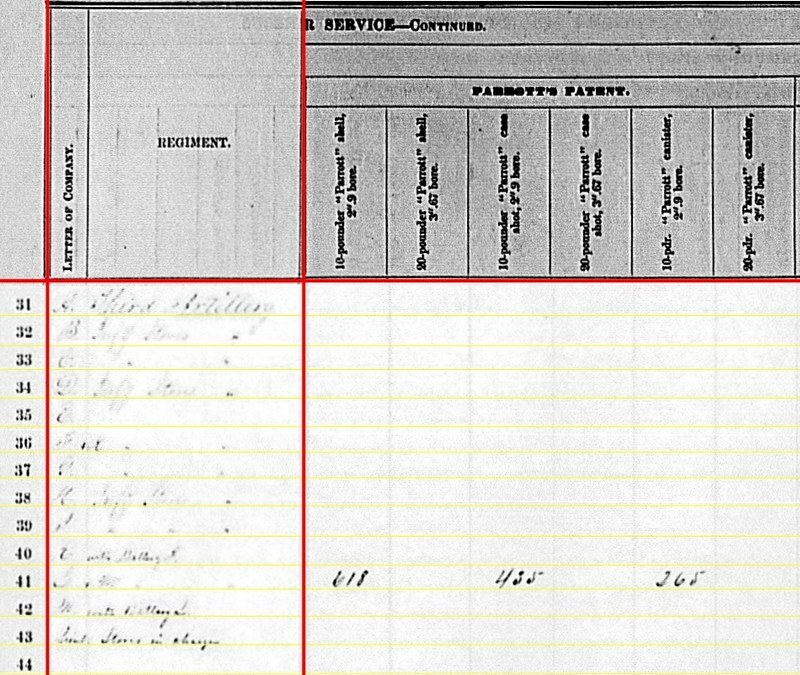 Andrews, of the 3rd Artillery, was returning to that post from extended duties elsewhere. Battery C: Simply “Army of the Potomac,” with six 3-inch Ordnance Rifles. Part of the Second Brigade of the Horse Artillery, Army of the Potomac. Still under Lieutenant William D. Fuller, the battery performed well in a sharp action on the Rapidan River, covering the cavalry, in mid-September. Captain Dunbar R. Ransom, recovered from a wound suffered at Gettysburg, resumed command near the end of September. The battery was still near Stevensburg, Virginia at the start of the Bristoe Campaign. Battery D: At Alcatraz Island, California with the annotation “Infy. Stores.” Captain William A. Winder, of the 3rd US Artillery, commanded the garrison of Alcatraz at this time of the war. Under his command were Batteries D and I (Battery H having moved out of that post). Battery E: No return. Serving in the Department of the South, under Lieutenant John R. Myrick. The battery had six 10-pdr Parrotts at this time. In late September the battery transferred from Morris Island to Folly Island. Battery F & K: No location given, but with four 12-pdr Napoleons. This combined battery was assigned to the 1st US Regular Brigade, Artillery Reserve, Army of the Potomac. In September Lieutenant George F. Barstow replaced Lieutenant John G. Turnbull as the battery commander. Battery G: Fort Turnbull, Connecticut but without any assigned cannon. Lieutenant Lewis Smith held command of this battery, just completing reorganization. Battery H: “Infy. Stores” with location as Fort Point, California. Captain Joseph Stewart appears on records as the senior officer in the battery. Battery I: Also “Infy. Stores” but on Alcatraz Island with Battery D.
Battery K: Annotated as “with Battery F”. See that battery’s notes above. Battery L & M: No location given, but with four 10-pdr Parrotts. Captain John Edwards remained in command of this combined battery. The battery was assigned to First Division, Ninth Corps. This well-traveled battery returned from Mississippi in time to participate in the Knoxville Campaign. 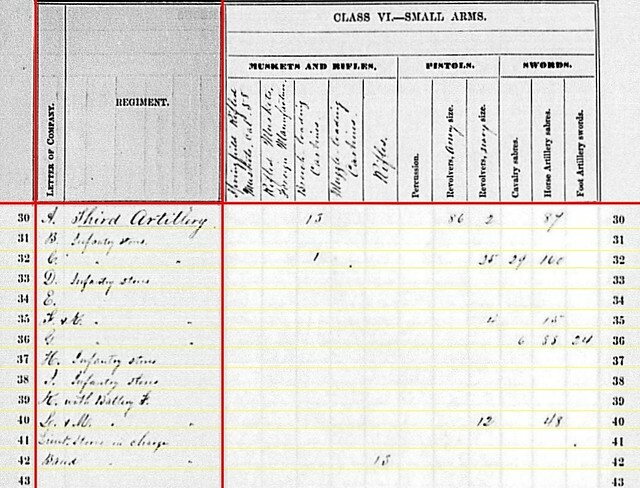 Lieutenant: “Stores in Charge.” This line tallied various implements and supplies, apparently assigned to a lieutenant of the regiment, but with no location indicated. 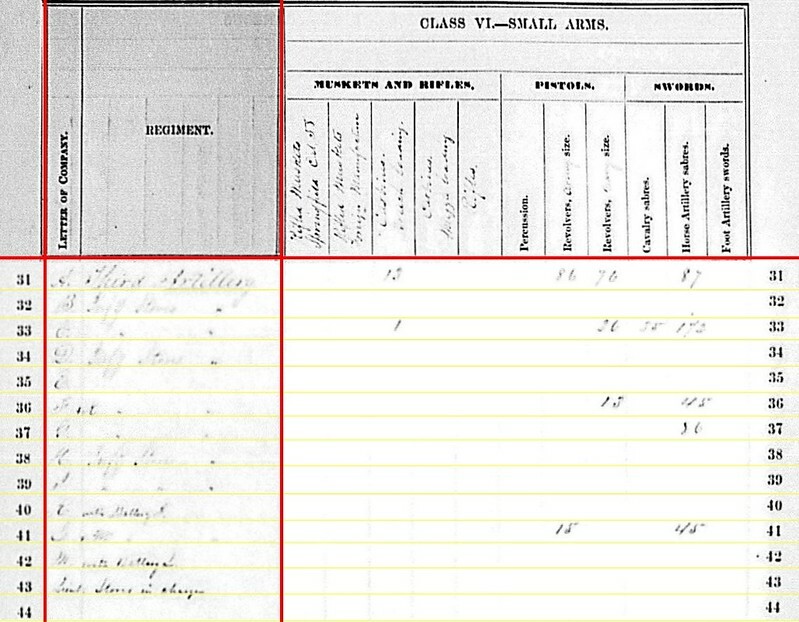 Band: Another “Stores in Charge” and listed at Fort Turnbull, Connecticut. Then again, maybe it is the scratchy photo negative. He’d fought in the War of 1812, Seminole Wars, and the Mexican War. Though his career was somewhat marred by the sinking of the SS San Francisco in 1853, carrying his regiment to California, and the loss of some 300 lives. Battery A: 148 shot, 112 case, and 216 canister for 6-pdr field guns; 170 shell, 240 case, and 88 canister for 12-pdr field howitzers. Battery F & K: 192 shot, 64 shell, 192 case, and 64 canister for 12-pdr Napoleons. As noted under the previous quarters, Battery A held on to ammunition for 6-pdrs it no longer had on charge. Battery A: 96 canister for 3-inch rifles. Battery C: 30 canister for 3-inch rifles. Battery L & M: 559 shell, 289 case, and 133 canister for 10-pdr Parrotts. Battery A: 254 shell and 288 case for 3-inch rifles. Battery C: 18 shell for 3-inch rifles. Thus, if we work strictly off quantities reported, Battery C seems short of projectiles. Battery A: Thirteen breech loading carbines, eighty-six Army revolvers, two Navy revolvers, and eighty-nine horse artillery sabers. Battery C: One breech loading carbine, twenty-five Navy revolvers, twenty-nine cavalry sabers, and 100(?) horse artillery sabers. Battery F & K: Four Army revolvers and fifteen horse artillery sabers. Battery G: Six cavalry sabers, eighty-eight horse artillery sabers, and twenty-four foot artillery swords. Battery L & M: Twelve Navy revolvers and forty-eight horse artillery sabers. Yes, the BAND with thirteen rifles! Perhaps somewhere in the Army’s vast bureaucracy is a library of forms accounting for musical instruments – drums, fifes, horns, and such. But this is “To the Sound of the Guns” and not Philip Sousa’s greatest hits! So here we must ask why the band had a baker’s dozen rifles? 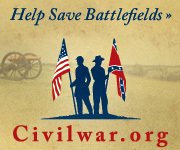 Perhaps Colonel Gates preferred a “fighting band”? Or, at least one that looked sharp for formal affairs and ceremonial guard. Toward that end, the band also reported thirteen sets of accouterments – cartridge boxes, cap pouches, belts, and bayonet scabbards. We find only four batteries reported having field artillery tubes on hand! Battery A – At Albuquerque, New Mexico with two 12-pdr field howitzers and two 3-inch Ordnance Rifles. Same as the previous quarter. And, updating my own notes here, Lieutenant John B. Shinn was in command of this battery (brevetted to captain for his service on the initial campaigns in New Mexico). Battery B – Given the annotation “Infy. Stores.” The battery remained at Fort Point, San Francisco, California. 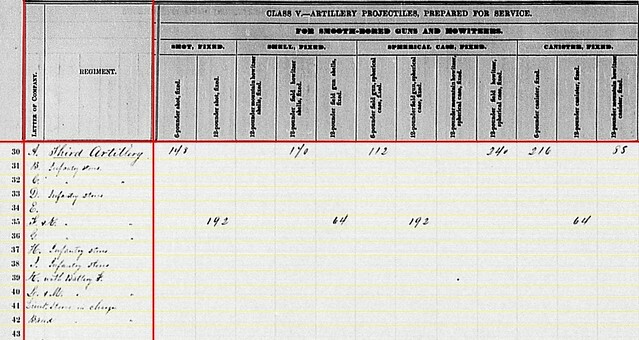 Battery C – No location given, but with six 3-inch Ordnance Rifles. Part of the Second Brigade of the Horse Artillery, Army of the Potomac. Lieutenant William D. Fuller was in command. The battery was not on the field at Gettysburg (and thus often left off some order of battle listings) but was with the Second Brigade, Second Division, Cavalry Corps at Westminster, Maryland. Battery D – At Alcatraz Island, California with the annotation “Infy. Stores.” Captain William A. Winder, of the 3rd US Artillery, commanded the garrison of Alcatraz at this time of the war. Under his command were Batteries D, H, and I (which we will mention below). Battery E – No return. Serving in the Department of the South, posted to Folly Island, South Carolina at the end of June. Lieutenant John R. Myrick was in command. Battery F – At Warrenton Junction, Virginia with six 12-pdr Napoleons. The location is certainly in error for the June 30th date, but accurate for August when the report was received in Washington. This battery, combined with Battery K (below), was assigned to the 1st US Regular Brigade, Artillery Reserve, Army of the Potomac, under Lieutenant John G. Turnbull. So the location was somewhere between Frederick, Maryland and Gettysburg, Pennsylvania. Battery G – Fort Turnbull, Connecticut but without any assigned cannon. The battery had been disbanded the previous fall and was being reorganized with new recruits. Eventually, Lieutenant Herbert F. Guthrie would command, but I am not certain as to the date of his assignment. Battery H – “Infy. Stores” with location as Alcatraz Island, California. Battery I – Also “Infy. Stores” and at Alcatraz Island. Battery K – Annotated as “with Battery F”. See that battery’s notes above. Battery L – At Columbus, Kentucky with six 10-pdr Parrotts. Combined with Battery M, below. Captain John Edwards in command. The battery was assigned to First Division, Ninth Corps. At the start of the spring was posted to Kentucky. In early June, the battery moved with its parent division to reinforce Vicksburg. And after the fall of Vicksburg the battery was part of the pursuit to Jackson, Mississippi. So a well-traveled battery. Battery M – “With Battery L” at Columbus. — At Lexington, Kentucky with six 10-pdr Parrotts. 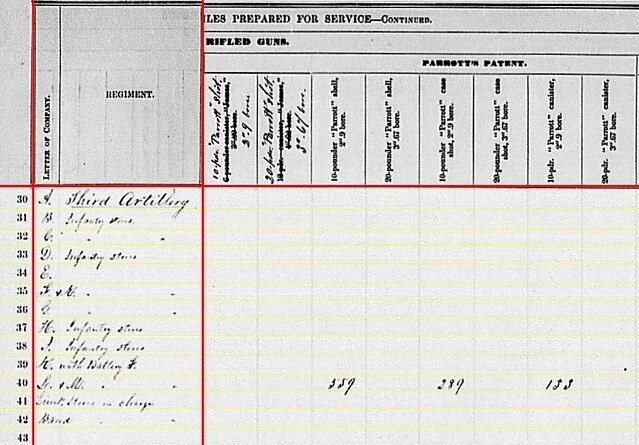 Lieutenant – “Stores in Charge.” This line tallied various implements and supplies, apparently assigned to a lieutenant of the regiment, but with no location indicated. Battery A: 148 shot, 112 case, and 216 canister for 6-pdr field guns; 170 shell, 240 case, and 88 canister for 12-pdr field howitzers; and 24 shells for 12-pdr field guns. Battery F & K: 360 shot, 96 shell, 198 case, and 104 canister for 12-pdr Napoleon. Battery F’s quantities, though with a rather high number of solid shot, are within reason. But Battery A, out there in New Mexico, held on to ammunition for a pair of 6-pdrs that were no longer on hand. I’m not going to say the 12-pdr shells there in Albuquerque were for Napoleons or the old 12-pdr heavy field guns. Regardless, their listing here raises an unresolved question. Battery A: 96 canister, 144 percussion shell, 110 fuse shell, and 288 bullet shell for 3-inch rifles. Battery C: 30 canister and 50 fuse shell for 3-inch rifles. Batteries L & M: 618 shell, 435 case, and 265 canister for 10-pdr Parrotts. Battery C: 18 shells for 3-inch rifles. That last entry fills up, somewhat, the allocation for Battery C. But one expect to see more. The report arrived in Washington in November, 1863. 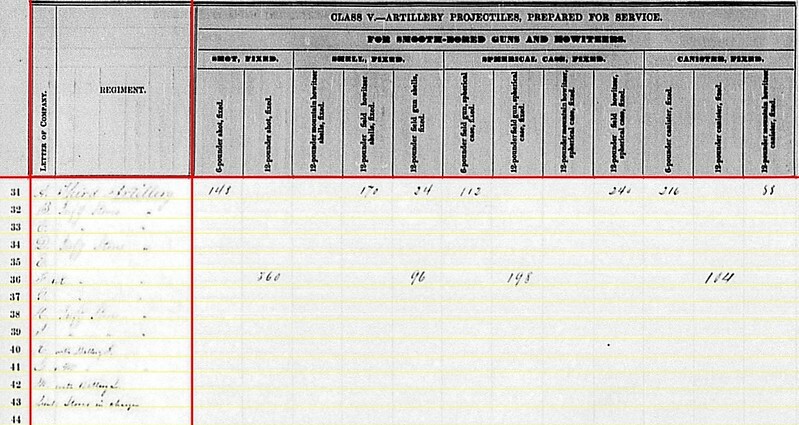 Battery A: Thirteen carbines, eighty-six Army revolvers, seventy-six Navy revolvers, and eighty-seven horse artillery sabers. Battery C: One carbine, twenty-six Navy revolvers, thirty-five cavalry sabers, and 172 horse artillery sabers. Battery F & K: Thirteen Navy revolvers and forty-five horse artillery sabers. Battery G: Eighty-six horse artillery sabers. Battery L & M: Fifteen Army revolvers and forty-five horse artillery sabers. I can understand Battery A, out in the far west and given many non-artillery duties, would need carbines, pistols, and sabers. But Battery C? That’s a lot of sabers… even for a data entry error!